gender equality – Can You Relate? 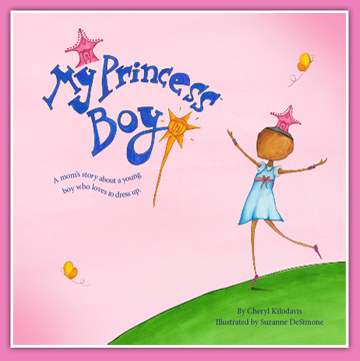 A new children’s book, My Princess Boy, tells the story of 5-year-old Dyson Kilodavis – a Seattle boy who loves dressing up in pretty, sparkly dresses – and his family’s support for him to be himself. A video of the Kilodavis family’s appearance on a local talk show has been viewed over 100,000 times. What Dyson’s family is doing is so simple, yet it has clearly touched a nerve. Kids do all kinds of funny things, but when boys cross gender lines, adults get anxious. Why? Sometimes it comes from a homophobic fear that a boy who wears princess dresses will grow up to be gay. Sometimes they’re just worried that he’ll be rejected by peers and targeted by bullies. I think we should worry more that when we pressure boys to reject “girl things” it sets them up to feel ashamed of important parts of themselves – the sweet, the expressive, the magical. Michael Kaufman argues compellingly that societal pressure on men to conform to “expectations of masculinity” contributes to men’s violence against women and homophobic violence. I have four young sons who like baseball and racecars and mud. They also like tight sparkly jeans, pink cowboy boots, and tutus. They like the things that make them happy not because they are “boy things” or “girl things” but because they are fancy, or fun, or (in the case of the glitter jeans) “sooo rock and roll”. I want them to know that the sparkly things in life are not off limits to them now or ever. Boys need adults’ permission to like what they like, and they need to see grown men who embrace beauty and sweetness.